NameCheap and Godaddy, Here Comes New Contender! There is a new domain daddy in town. 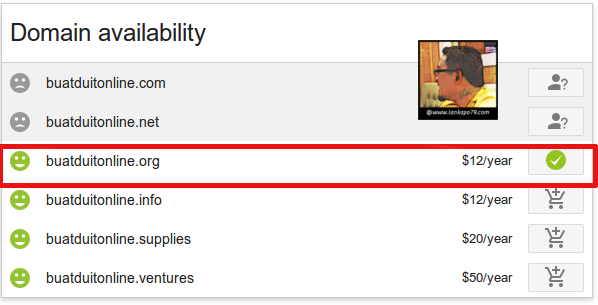 Google is very serious about domain business. Google wants to complete blogger with Google domains. So internet user can totally use Google service when blogging at cheaper cost. Google has opened up their domain services to all US internet user. Last year, only user with invitation can use Google Domain services. Simple Domain Management Tools. You can configure domain, website and email setting with just a few clicks. Easy Integration with Blogger . Private Registration at no cost. Unlike other domain registrar, you have to pay extra to hide your details. Fast, Reliable and Secure Internet Google Infrastructure. For me Google = Internet, if Google down, then Internet must be down too. Customize your domain with up to 100 sub-domains, For example lankapo.com, you can have best.lankapo.com, powerlah.lankapo.com and a lots more. Its look like sooner or later, i should transfer all my domains to Google Domains. 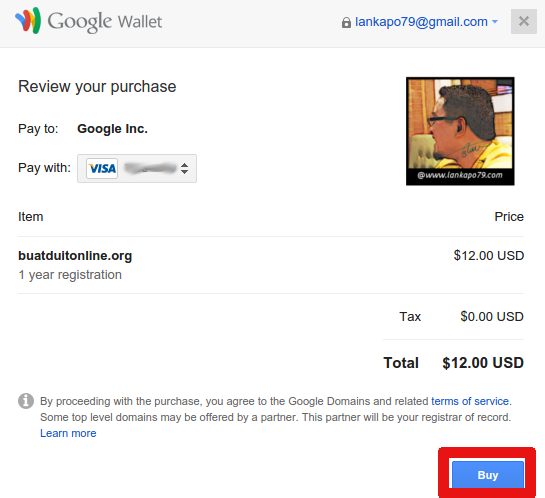 I just found this trick to buy domain from Google. You need to have an address in US. That’s all. A few domains are still active and updated. The rest is still without a hosting. 1. 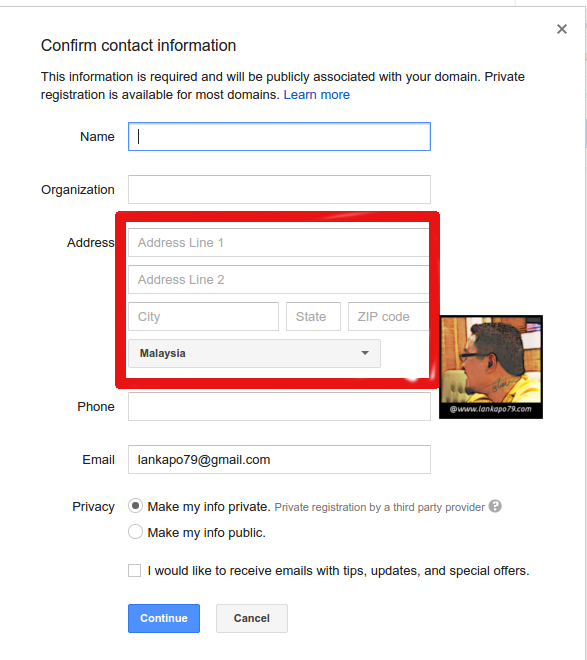 First, Register at Google Domain by using your gmail account. Then search for your favorite domain keyword. 3. Domain availability will pop up, select your desired domain and please make sure you have enough balance in your debit card /credit card before you make a purchase. 5. Fill in your personal details. Make sure your address is valid and legitimate. Also make sure that your address is the same with your card billing address. DO NOT use US address here. 6. Next step, fill in your card details. i just use my Maybank Debit Card. Pay attention on the red box. On Name and Hone Location, make sure you put your name and US postcode. 7. 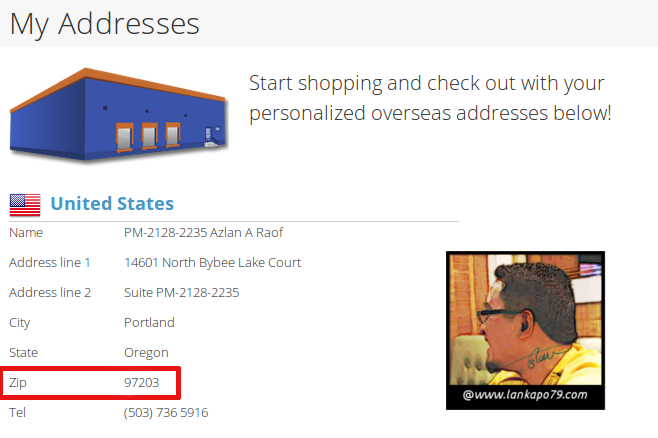 Actually I got the US postcode by using EziPos Malaysia. Any other US valid postcode should be work actually. I just want to be on the safe side. Remember Google did say that as long as you have a US billing address, you are good to go. 9. 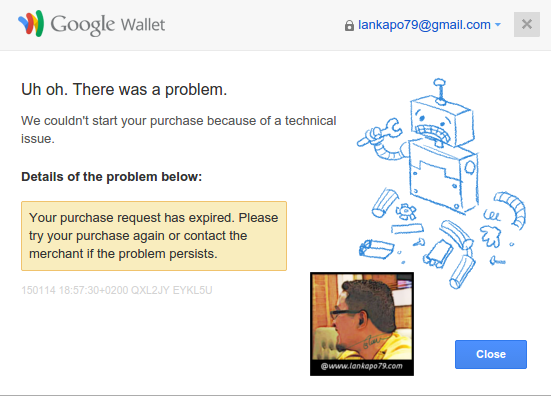 After you repeat with buying process, Google Wallet screen will appear like below picture. Google has identify you as user from US. Proceed by clicking BUY button. 10. 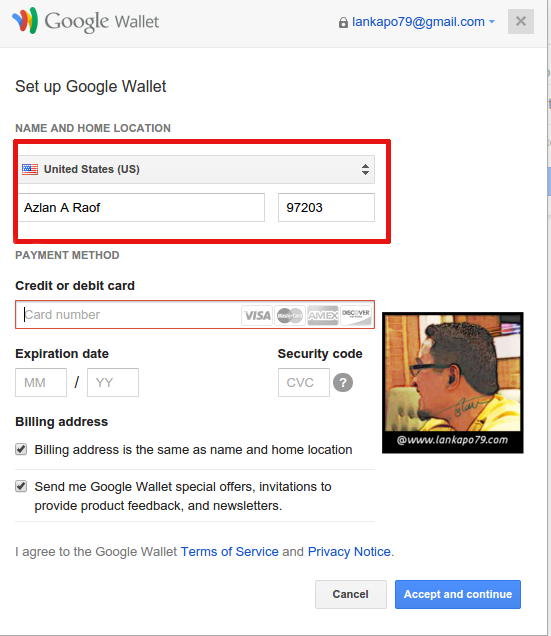 Final step, after Google successfully charge your card, you will have this simple management domain tool like below. You can link/forward your domain to blogger or existing website. You can also create sub domain and email easily. The GUI is straightforward. Good Luck by trying this method. I just want to say that I will not held responsible if you fail or loose money in order to purchase domain from Google Domains. Try at your own risk. I believe that there is a bug at step no 8. I just hope that by the time that Google realize that bug, Google Domains already open to all. So far I already bought one domain and have no problem with it. One tiny problem, if you change the DNS, you will be not able to use email and subdomain features. So I just stick with Google DNS and point my domain to blogger platform. Ok that is all for now. See you and have a nice day. Hi , great post you have here and thanks a lot!